Determining what problem(s) your car has may seem like an impossible task, especially to the untrained eyes and ears of the average driver. It may be helpful to think of your car’s inner workings as similar to that of the human body. For instance, if you have chest pain that could point toward any number of health issues, but if the chest pain exists in addition to difficulty breathing, then it is much more likely that asthma (or something very similar) is the cause. Automotive problems are diagnosed in a similar manner. Problems that involve mechanical systems typically exhibit distinct sensations and sounds that act as indicators that a certain process isn’t working the way it is intended to. As soon as you recognize that something seems a bit “off” with your vehicle’s functionality, it is time to assess the issue and look for a way to fix it. Diagnosing car problems yourself may seem like an impossible task, but try to think of it in terms of your own body. For instance, if your stomach begins to hurt without warning, you’ll probably start thinking of the last thing you ate in order to figure out why you’re having the pain. A similar type of thinking goes into diagnosing car trouble. The moment you start noticing something out of the ordinary, it’s time to start considering the problem and finding a way to fix it. Need Your Transmission Repaired? A good repair shop can be hard to find – especially on short notice. We’ll have the Cost Guide Certified shop in your area give you a call with a free estimate. It’s impossible to say exactly what your car will sound like when there is trouble with your transmission, but one thing is for sure, you’ll get a “I haven’t heard that sound before” feeling when you notice it. The sounds that are produced vary widely between different makes and models, but the best way to describe them is that you’ll probably hear a humming, buzzing or whining noise. ATF is bright red in color, clear and smells somewhat sweet if everything is working correctly. If this is what you find on your driveway, then all that needs to be fixed is the hole. If the fluid is dark and/or has a burnt smell then it’s time to get the fluid changed or flushed and repairs might be required. To check if you’re running low on fluid, take your car for a short drive to warm it up and then lift the hood and read the dipstick (be sure the vehicle is on level ground). Unlike motor oil, transmission fluid is not burned off or consumed by a car so if the level is low then there is a leak somewhere that must be patched. It is recommended to top up the fluid anyway even if the leak still exists to make sure there is enough fluid for the transmission to function properly until you get it fixed. Any burning smell coming from your car is a cause for concern. 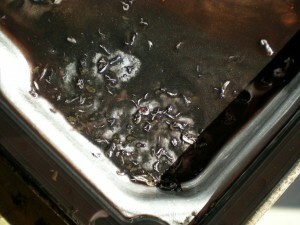 Overheating transmission fluid is one of the causes of a burning smell. Transmission fluid helps keep the parts lubricated and cooled so that they don’t get worn out and damaged. If the fluid breaks down, the system runs too hot which it results in increased friction and corrosive activity as well as the build up of additional sludge and debris. If this is not taken care of, the transmission will eventually damage itself enough to break down completely. The end result is an expensive replacement. Common causes include low fluid level or using the incorrect brand/type of fluid. To check for these, see the instructions in the section on Low/Leaking Fluid above. 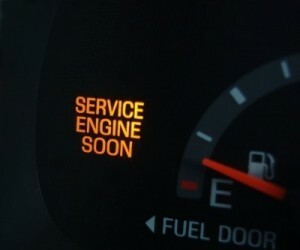 The check engine light located on your car’s dashboard is a great early indicator that something is about to go wrong (or already has) with your car, and in particular with your transmission. While the light turns on for a number of reasons other than transmission issues, it very important not to ignore this helpful warning sign. There are sensors placed in many areas of a car’s engine that alert the computer if it senses unusual activity coming from a particular process. The sensors on a transmission can pick up on the slightest jerks and vibrations than you are not able to see or feel. Take the vehicle in and have it inspected. They can take look and immediately tell what is happening through the use of similar diagnostic tools and the car’s computer. If you’d like to diagnose the problem yourself (and possibly save yourself a trip to the mechanic’s) you can buy a diagnostic scan tool that is plugged into the instrument panel on the driver’s side and return a code that corresponds to the part that needs attention. Whatever you do, do not assume that the check engine light can wait because it might be warning you of a serious problem in the near future. Has your transmission completely failed? Here are your 8 options to repair, replace, junk it, etc. It is important to keep up a regular maintenance schedule for your car. Many times major expensive repairs can be avoided if the vehicle is properly maintained. This is especially true if you notice something unusual. The car should be taken in immediately for service. Brushing up on your knowledge of transmissions (at least the basics) is highly recommended as it can help you save money by avoiding costly inspections and doing simple procedures such as changing transmission fluid yourself as well as making you knowledgeable enough to avoid being over-repaired, over charged or simply ripped off. I’m glad you said that the clutch might need to be replaced if there’s grinding after you shift to another gear. I have a Yaris that doesn’t shift smoothly, and there’s a terrible grinding sound when I do. Maybe I should find a Toyota service that can adjust or replace the clutch so the sound will stop. I’ve been hearing a whining noise from my car, and I’m not sure what it could be. I didn’t know that it could be the gearbox! Maybe it would be a good idea for me to get a professional to fix that for me. 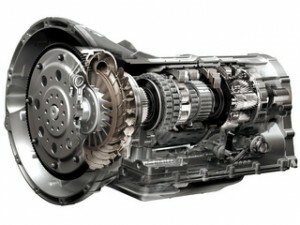 Transmission plays a vital role, hence needs proper maintenance to ensure better performance of the transmission. Any types of damage to the transmission has diverse impacts on the performance of the vehicle. So, any sign of transmission failure should be identified and should be repaired immediately by a reliable repairing center( e.g.- https://dreamcarsautorepair.com/our-services.html ). Transmission oil plays a crucial role in the operation of the vehicle and needs inspection on a daily basis and should be replaced at a regular interval. If the level of engine oil is decreasing, then the reason behind it should be find out and should be repaired immediately. Thank you for sharing such common transmission problems, which needs to be identified and repaired in time in order to prevent any types of major damage in near future. 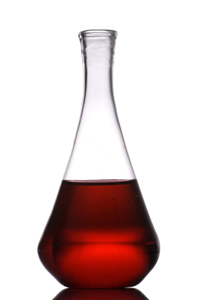 One of common symptom of problematic transmission is the leakage of transmission fluid. In order to prevent such problem, we have to identify the pinhole which is the possible cause of transmission leakage and should repair it in time by trusted professionals ( You may visit: http://techplusautomotive.com/services/).